Offering the next generation in fast and simple connectivity, Thunderbolt™ 3 is a cable developed by Intel that can transfer data, video and audio – all via a single connection. Now, Samsung Electronics is responding to increasing consumer demand for the swift transmission of high-definition and high-specification content from device to device by creating innovative products that support Thunderbolt 3. With support for up to 40Gbps of high-speed data transmission, Thunderbolt 3 transfers data eight times faster than USB 3.0. The connection also provides a video bandwidth that is four times greater than HDMI 1.4, when transmitting audio and video signals. When the cable is connected to an accessory dock with additional ports, an individual Thunderbolt 3 cable can connect up to six devices all at once, including PCs, displays and storage devices. This means that the cable has the capacity to transfer large files and charge a device with a maximum 100 watt (W) output simultaneously, or transmit videos onto two UHD (4K) monitors. The Thunderbolt 3 cable can also be used to connect a laptop to a high-performance graphics card, allowing users to enhance their gaming experience. 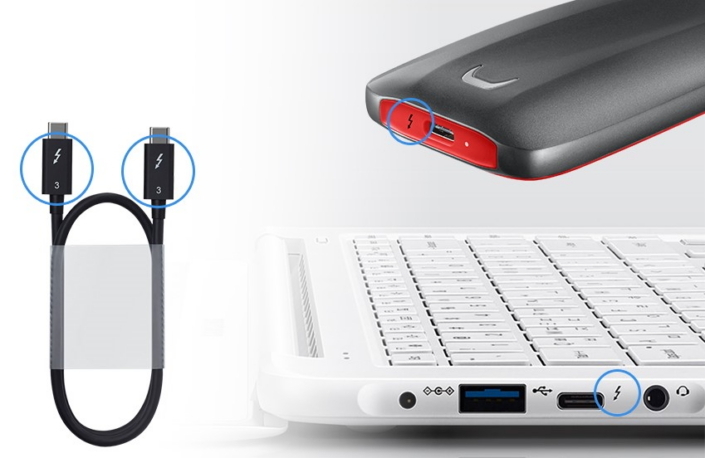 Thunderbolt 3 has the same shaped connector as a USB-C (USB type C), which is designed to connect to smaller mobile devices, with no distinction between the top and the bottom sides. The cable is embedded with a USB 3.1 host controller to facilitate all USB functions. However, it is important to note that you cannot use a Thunderbolt 3 connection on a PC that does not support the Thunderbolt 3 interface, even if the device has the same USB-C type port. PCs that support Thunderbolt 3 can be connected to devices with either Thunderbolt interfaces or USB interfaces. However, a PC that does not support Thunderbolt 3 cannot be connected to Thunderbolt 3 devices. 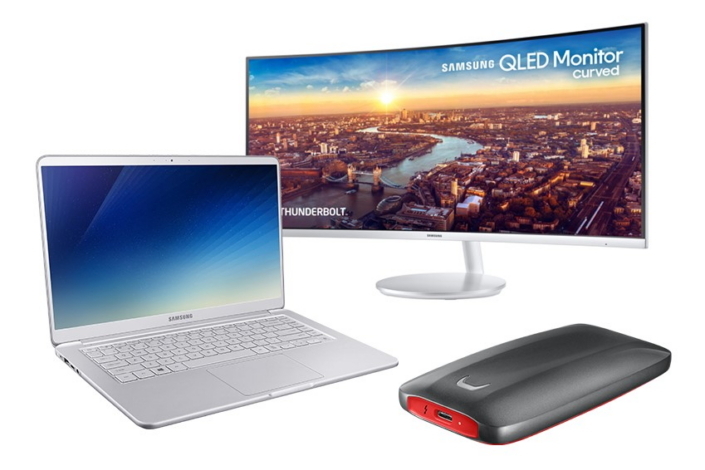 Bringing the benefits of this next-generation connectivity to consumers, Samsung has introduced three products that support data transmission via Thunderbolt 3. The 2018 Notebook 9 Always model is a sleek and powerful laptop with a high-capacity battery of 75 Watt-hours (Wh). The product is equipped with two USB 3.0 ports and one USB 2.0 port, as well as a USB-C port that supports Thunderbolt 3.0, making the device even more extensible. Samsung’s CJ791 QLED Monitor was the first curved monitor to feature Thunderbolt 3 connectivity, with two ports. The display provides a high-definition environment for work and play, not only when connected to a PC, but also to a premium laptop equipped with the Thunderbolt 3 interface, such as the 2018 Notebook 9 Always. The Thunderbolt 3 interface also enables the CJ791 to provide up to 85W of charging power. With this one cable, users can enjoy excellent graphic output, while simultaneously charging a laptop and a smartphone at high speeds. The Samsung Portable SSD X5 achieves new levels of performance for external storage solutions, synergizing Thunderbolt 3 and NVMe (Non-Volatile Memory Express) technologies. The X5 can store a high-definition 4K UHD video file of 20GB in just 12 seconds, while also implementing heat-control technology to safeguard the device from overheating. Thunderbolt 3 offers the fast, safe and convenient transmission of data, video and audio at high speed in a single cable. The cable also supports USB-C, the newest standard in USB connectivity, making it even more versatile. As consumer demand for heightened connectivity and utility grows, Samsung Electronics will continue to develop even more innovative products that support Thunderbolt 3 in the future.